A majority of Americans say they think senior members of Donald Trump’s administration definitely or probably had improper contacts with Russia during last year’s presidential campaign. 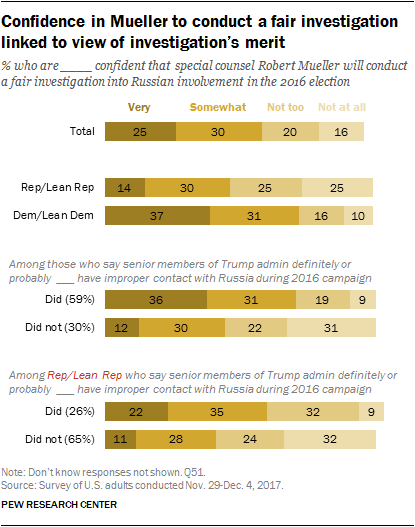 And most are at least somewhat confident that special counsel Robert Mueller will conduct a fair investigation into the matter. Republicans and Democrats are deeply divided in views of possible wrongdoing by senior administration officials, as well as in confidence in Mueller to conduct a fair investigation. In addition, while just 19% of Republicans view the Russia probe as “very important” to the nation, more than three times as many Democrats (71%) say the same. The new national survey by Pew Research Center, conducted Nov. 29-Dec. 4 among 1,503 adults, finds that President Trump’s job approval rating has declined over the course of his first year in office. Currently, 32% of the public approves of the way Trump is handling his job as president, while 63% disapprove. Trump’s job approval is little changed since October (34%), but lower than in early February (39%), a few weeks after Trump’s inauguration. Pew Research Center surveys are based on the general public, rather than registered or likely voters. Trump’s approval rating in the current survey among registered voters is 34%. (For more on the differences in these bases, see “A basic question when reading a poll: Does it include or exclude nonvoters?”). While just 30% of Americans think senior Trump officials definitely had improper contacts with Russia during the campaign, a majority (59%) thinks such contacts definitely or probably occurred; 30% think they definitely or probably did not happen. In views of Mueller’s investigation, 56% are very or somewhat confident he will conduct the probe fairly. Only about a quarter of Republicans and Republican-leaning independents (26%) say Trump officials definitely or probably had improper contacts with Russia during the campaign; 82% of Democrats and Democratic leaners think there were improper contacts – with 49% saying they definitely took place. About two-thirds of Democrats (68%) and 44% Republicans say they are at least somewhat confident Mueller’s investigation will be conducted fairly. The survey was being conducted when Trump’s former national security adviser, Michael Flynn, pleaded guilty to lying about contacts with Russian officials during the presidential transition. There are no significant differences in opinions about whether senior administration officials had improper campaign contacts with Russia, or in views of Mueller’s investigation, in interviewing conducted before and after Flynn pleaded guilty on Dec. 1. In addition, more Democrats (55%) than Republicans (46%) say the status of immigrants who came to the U.S. illegally as children is a very important issue. No current development or issue, among five tested, is as divisive as the investigation into Russia’s alleged involvement in the 2016 election. 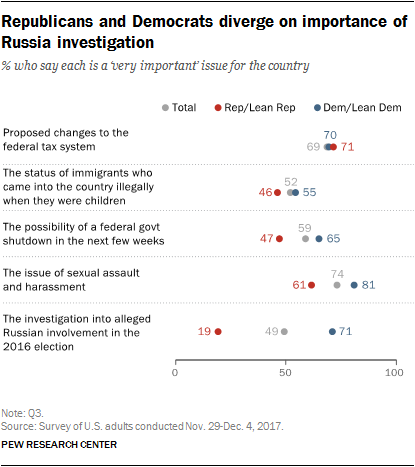 Few Republicans (19%) regard the investigation as very important, while another 15% say it is somewhat important; a majority (64%) say it is not too important (19%) or not at all important (45%). By comparison, just 10% of Democrats view the Russia investigation as either not too important or not at all important. 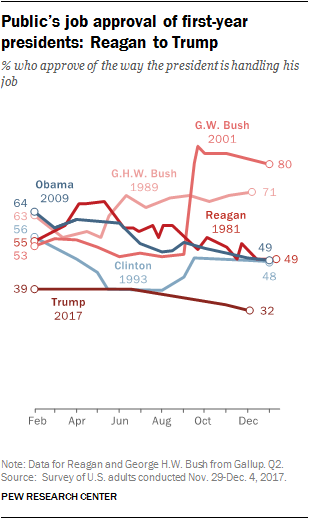 Trump’s job rating of 32% is lower than those of recent presidents dating back to Ronald Reagan near the end of their first year in office. In follow-up questions, those who approve of Trump were asked if he has done things that have disappointed them, while those who disapprove (63% of the public) were asked if he has done things they have been happy with. Overall, 37% of Trump approvers cite something Trump has done to disappoint them (62% say they can’t think of anything). In December 2009, by comparison, somewhat fewer (30%) of those who approved of Barack Obama’s job performance said there was something Obama had done that had made them unhappy; at the time, Obama’s job approval was 49%. The criticisms raised by Trump supporters are quite different from those cited by Obama’s backers eight years ago. About a quarter (26%) say they have been disappointed by aspects of Trump’s personal style, with 14% specifically mentioning his use of Twitter or social media. An identical share (14%) points to his behavior or speech. Only 13% of those who approve of Trump cite a disappointment related to policy. In December 2009, disappointments among those who gave Obama a positive job rating were mostly about policies, not Obama’s personal style. Just 5% of those who approved of Obama cited an aspect of Obama’s personality or style, while 29% said they had been disappointed by policies such as Afghanistan or health care. Among the majority of Americans who disapprove of Trump’s job performance, 14% say there is something he has done that they have been happy with (84% say they are unable to think of anything). The most frequent responses focus on Trump’s domestic policies (8%), while just 3% mention his personal style. Eight years ago, a higher share of those who disapproved of Obama (24%) said there was something they had been happy with; as with Trump, most who disapproved of Obama’s job performance in 2009 cited policies, rather than his style, as what they had been happy with. Since Trump became president, his job approval ratings have been more polarized than past presidents during their first year in office. That remains the case today, but his job ratings are lower today among Republicans than they were in February. His ratings are virtually unchanged among Democ rats. Currently, 76% of Republicans and Republican leaners approve of Trump’s job performance, compared with 84% who did so in February. Trump’s job approval among Democrats and Democratic leaners is 7%, about the same as in February (8%). Trump’s job ratings continue to be divided by gender and education. While 40% of men approve of the way Trump is handling his job as president, only 25% of women do so. Fewer than a third of adults with postgraduate degrees (24%) or four-year college degrees (27%) approve of the way Trump is handling his job, compared with 35% of those who have not completed college. 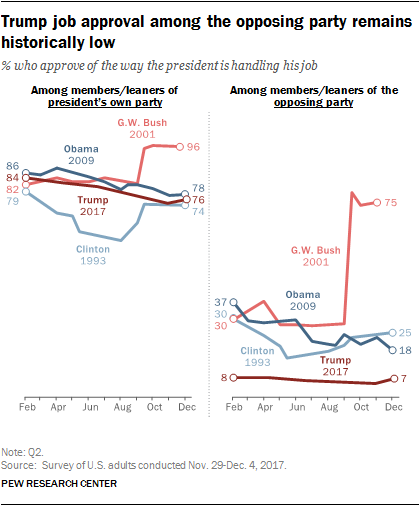 Trump’s job approval rating among members of his own party, while lower today than at the beginning of the year, is in line with those of most of his predecessors. The lone exception is George W. Bush, whose job rating surged after the terrorist attacks of Sept. 11, 2001. However, Trump’s job ratings among members of the opposing party have been consistently lower than those of recent presidents. For example, Obama lost considerable support among Republicans in 2009, his first year in office; his job rating among Republicans plummeted from 37% to 18% over the course of the year. Still, Obama’s year-end job rating of 18% among Republicans was more than double Trump’s current job approval among Democrats (7%). Overall, views of the productivity of Congress are little changed over the past few years. When asked to compare the current Congress to recent sessions, about half of Americans (52%) say that it has accomplished less than usual, 8% say that it has accomplished more, and a third (33%) say that it has accomplished about the same amount as recent sessions of Congress. The public expressed similar views about congressional productivity in 2014 and 2011. 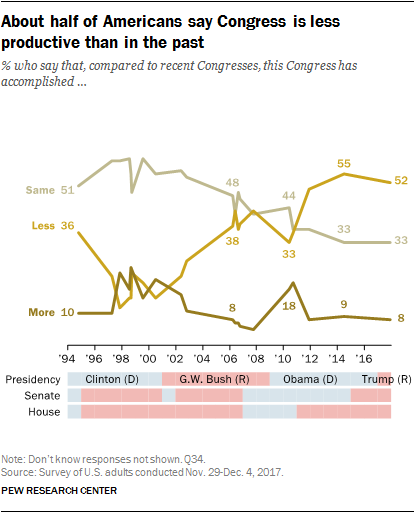 However, earlier in the 2000s and in the late 1990s, views of Congress’ accomplishments were less negative; no more than about four-in-ten said those Congresses had accomplished less than their predecessors. While overall opinions about congressional productivity have changed little in recent years, there has been substantial movement among partisans. In July 2014, when Democrats held a narrow majority in the Senate and Republicans held a majority of seats in the House, about six-in-ten (58%) Republicans and Republican leaners said that Congress had accomplished less than usual. Now that Republicans are in control of the White House and Congress, that figure has declined to 37%. By contrast, Democrats have become much more critical of congressional productivity since 2014. 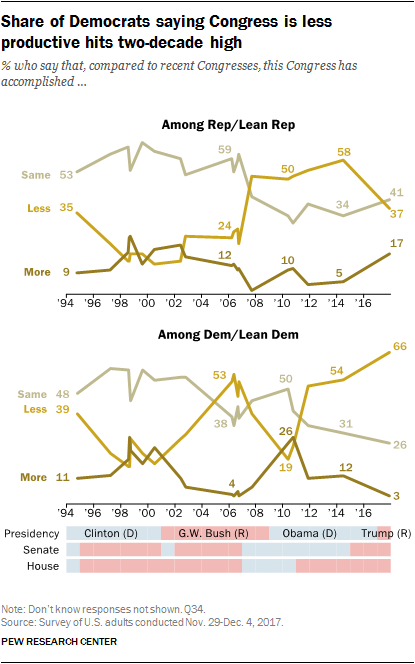 Currently, 66% of Democrats say Congress has accomplished less than in the past, up from 54% three years ago and the highest share saying this in more than 20 years. Among those who say Congress has accomplished less, more than half (56%) blame Republican leaders for this lack of accomplishment. A smaller share (23%) volunteer that leaders of both parties are to blame, and only a small minority (16%) says Democratic leaders are most to blame for the lack of accomplishments by Congress. This figure is similar to other points when Republicans held united control of the government. In April 2006, for example, Republicans controlled the presidency and both chambers of Congress, as they do today. At that time, fewer people said Congress had accomplished less (38% then, 52% today), but GOP leaders received most of the blame for this, as they do today. Overall, 56% of Americans are either very (25%) or somewhat (30%) confident that Mueller will conduct a fair investigation into Russian involvement in the 2016 election, while 36% say they are not too (20%) or not at all confident (16%) he will do so. As with opinions about whether or not senior Trump administration officials had improper contact with Russia during the campaign, there are partisan differences in confidence in Mueller: 44% of Republicans and Republican leaners are at least somewhat confident that Robert Mueller will conduct a fair investigation, compared with 68% of Democrats and Democratic leaners. (By comparison, 82% of Democrats vs. just 26% of Republicans say improper contacts definitely or probably occurred). Views of the investigation are related to beliefs about whether there were improper contacts between senior Trump officials and Russia during the 2106 campaign. Among those who say that it is at least probable that senior members of the Trump administration had improper contact with Russia, 36% are very confident that Mueller’s investigation will be fair and another 31% are somewhat confident. Among those who think that there was probably or definitely no improper contact, only 12% are very confident in a fair investigation, while 30% are somewhat confident. Among Republicans and Republican leaners, 58% of those who say senior Trump officials probably or definitely had improper contact with Russia during the 2016 campaign are at least somewhat confident in Mueller to conduct a fair investigation, compared with 39% of those who think no improper contact occurred.